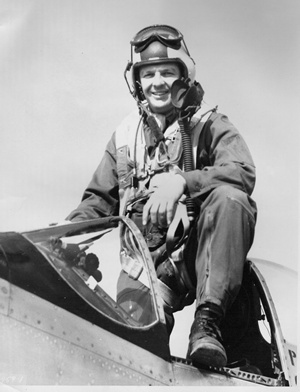 Korean War Hero Lt. Col. Richard H. Schiebel. If any of the students at Ball High School knew he was Lt. Col. Richard H. Schiebel, a Korean War hero, who in the years before had flown an F-51 all through the war zone, successfully completing 100 missions against the enemy, they didn't talk about it. Perhaps it was no big thing. For after all, except for less than a handful of years, war had been with them for their entire lives. Or maybe it was because it was still in the days of teenage naivety. For an example, while the principal's name was George Morton, behind his back the kids called him Moose, all the while secretly and falsely congratulating some unknown student they figured had invented that name for Mr. George. Throughout those years, no one broke that bubble by telling them that his nickname had come to him as a football player at the University of Texas, and that he liked being called Moose. For all I know, Mrs. Morton probably calls him Moose. By 1955 when we first encountered Mr. Schiebel, he was strolling the halls of Ball High, usually in gym shorts and tee-shirt with a coach's whistle hanging on a lanyard around his neck, and the Board of Education in his hand, applying it to backsides here and there - a soft swat to accompany a friendly hello; a sincere and swift pop if you were cutting up. "Behave," he would say. What's odd is that Coach Schiebel was only a member of the faculty for two school years, yet almost every Ball High graduate over 50-years old will all but swear he taught them. Coach raised two superb tennis teams, taught any number how to bowl and swim with good form, and explained to anyone who would listen, rather than throw spit balls or pass notes, the evils of not maintaining good health habits. 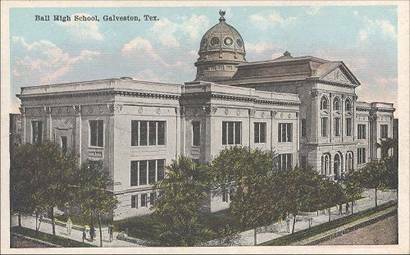 "The old Ball High School that was in downtown Galveston on 21st and Ball. It was converted to the home office for an insurance company, the dome was removed and another building was added on to it. The replacement campus for Ball High opened, I think, in the Spring of 1954. That's where I went to school and where Coach Schiebel taught. It's on about 43rd and Avenue O." - Bill Cherry. While Coach and I met at Ball High when I was 15, and have been friends for almost 50 years, like many Ball High graduates who keep in touch with him, I was never formally in one of his classes. Nevertheless, in recent years, Coach has decided it's his obligation and duty to critique my weekly columns. And while his criticisms are worthy, more often than not, I find myself thinking that a teacher I never had, who taught in a school whose halls I haven't roamed in 46 years, and who didn't teach composition in the first place, could get along with me better if he'd keep his comments to himself. But he won't, so I purposely aggravate him by including a word or two in each column that I figure he's never heard before. It stirs his ire like a charm. What's a "paronomasia"? he emailed. "My Funk and Wagonals is downstairs." "It's a pun," I respond. "Why didn't you just use 'pun'?" he grumbles back. Coach told me once that the only job he ever had that he liked better than teaching at Ball High was flying missions in Korea. Wanting to defend one's country, even if it cost you your life, was something his generation understood while many of my generation and those that followed didn't. Coach Schiebel's friend Herman Burton has copies of a number of the letters that Coach wrote home from Korea. For an example, just days before Easter 1951, he wrote to his parents in Dallas about Mission No. 37. He was a first lieutenant. "I napalmed a house with enemy truck tracks leading into it, and got a gun position on the top of a hill with my other one. Tandy, flying with me, located another gun position and asked me to mark it for him with a short burst of 50s. I go pounding in and make a short burst on it right on top of a hill. I must have hit a rock or something because just as I pulled up over the top of the hill, something hit the canopy about eight inches from my head....I ducked and closed my eyes...and missed the Plexiglas chips that hit my face. It knocked a hole...in the canopy and cracked it in a circle behind my head. 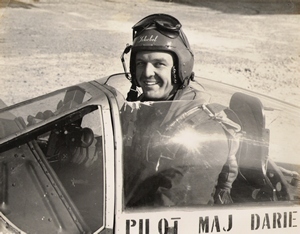 The actual photo taken of Major Schiebel when he landed the plane that had the canopy blown off. "...I punched the rocket tab. I thought an explosion had gone off in the canopy. It was a tremendous roar.... The whole top of the canopy blew off, and the racket was terrific from the air blowing around the new 20 inch hole above my head. It sounded like a cannon in my ear. The suction almost ripped my helmet off. We immediately went home. "But you should have seen the faces of the G.I.s when I taxied by waving at them through the top of the canopy." It's easy to take this whole accounting as one of whimsy, rather than that there was deep gut fear. Coach is like that. And yet one of his unidentified Korean War comrades did explain it well when he wrote, "There is no glory in war, no shame in being afraid, only pain and suffering for the unfortunate ones whose bodies are maimed, minds scared and for whom recovery is a long hard struggle. "Those who lost their lives will never be forgotten by their comrades. Even almost 50 years after my first exposure to combat, I still hear the screams of agony, see the terror in faces and hear their last ragged breath. You see, we who survived continue to endure a terror that only those who have been there understand." We are left to wonder if the reasons Americans gave their lives are really shibboleths to the generations that have followed. Is it that the new generations have chosen to bloviate them with endless mumbo-jumbo, as a lame attempt to disguise that which is diaphanous - their own fear that they may be cowards, and will do anything to keep from having to learn the truth about themselves or to have to let us in on their secret.